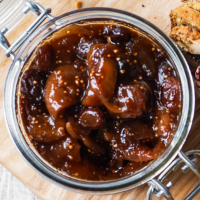 Ideal as part of a cheese gift box, this relish is of the type that can, and should, be eaten soon after making rather than being left for months to mature. It’s delicious with the oaty biscuits, nut and cherry crackers and just about any cheese, or even cold cuts. 1 Tip all the ingredients into a large saucepan; place over a low heat and stir frequently to dissolve the sugar. Bring to the boil, reduce to a simmer and continue to cook gently for about 25-30 minutes, stirring frequently, until thickened, glossy and jammy. 2 Discard the cinnamon stick and bay leaf, then season the relish and cool before packing into new, sterilised jars. FYI: The relish can be stored in new, sterilised jars for up to 3 weeks. Once opened, store in the fridge and eat within 1 week.